These coconut-cacao-covered strawberries are a breeze to make. A lot of folks have questions about the difference between the raw cacao powder I often use in my dessert recipes and cocoa powder. The difference is this: Cacao powder has no added sugar, and because the cacao beans are processed at low temperatures, this powder is full of antioxidants and minerals (like magnesium and iron) that you would find in the cacao bean. Cocoa powder is usually more processed, so these nutrients are often lost during the processing. I do think cacao powder and cocoa powder taste slightly different, but feel free to use cocoa powder in this recipe if that is what you have on hand. Also, I recommend adding your own mix-ins, like chopped nuts or shredded coconut. 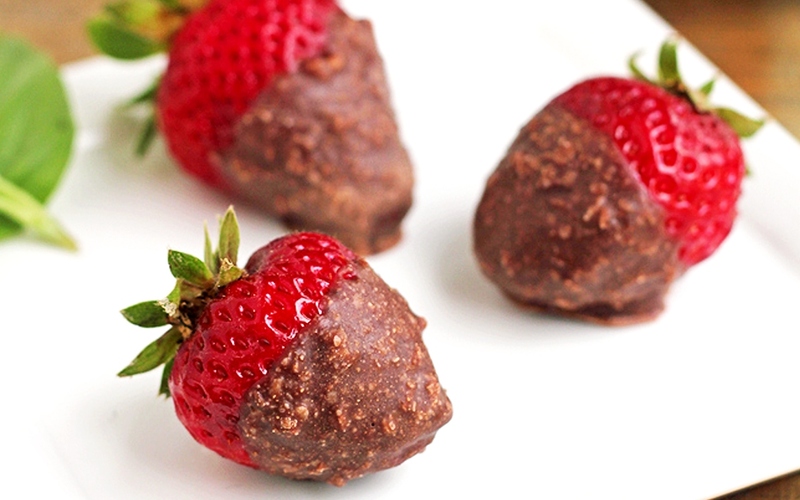 I mixed a bit of chopped pecans and shredded coconut with my coconut butter–cacao mixture and then dipped the strawberries right in. If you’re feeling fancy and want to make a prettier presentation, you can also dip the strawberries in the coconut butter–cacao mixture, then roll them in the chopped nuts or shredded coconut (or other mix-ins as desired) so the nuts and coconut are on the outside. 1. Mix coconut butter with maple syrup, cacao powder, and sea salt. Mix in chopped nuts or extra shredded coconut (if using). 2. Dip berries in coconut-butter mixture and refrigerate until serving.